Favorite Line: "And I try, and I made it." 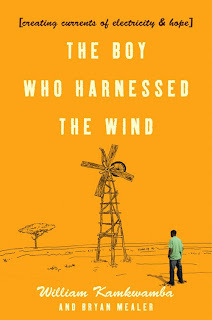 William Kamkwamba grew up in Kasungu, Malawi, a village that depends almost completely on farming and is prone to floods and droughts. He was the only son of a poor family, and when it was planting season, or harvest season, he would have to stay home from school to help out around the farm. And when there were floods or droughts, his family couldn't afford to send him. Eventually, William dropped out of school. He wasn't willing to give up on learning, though, so he began visiting a library, checking out books on science and energy, particularly. After reading about different ways of creating energy and power, William set about making a windmill to power his home, bringing light and electricity to his family. His eventual goal was to use wind power to help irrigate his village so that people weren't at the mercy of the rains and government. 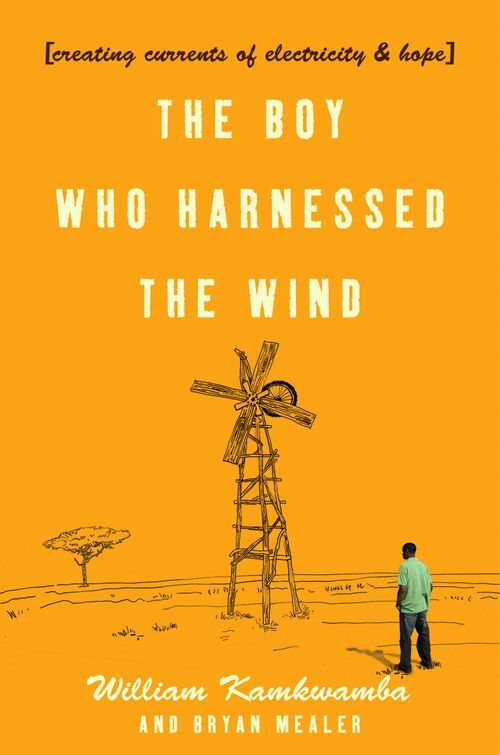 His windmill earned him a great deal of interest and news, and he became an international green entreprenuerial sensation (all at the tender age of 13!). It's really amazing to me sometimes how smart people can be. And how innovative. I've never been the sort to really think about how things work; I just appreciate when they do and get annoyed when they do not. But I have a great deal of respect for anyone that can take something apart and put it together again. And for people who can improve things. 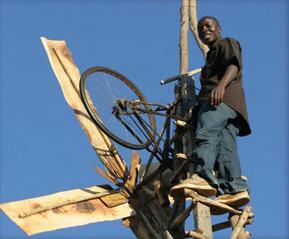 Especially those that are self-taught, as William Kamkwamba is. This is a really important book. Not really because of its storytelling ability- yes, it tells William's story, and it's interesting to follow, but not gripping or breath-taking. But because it really is about a real person who wanted something and went after it. And improved his own life, his family's life and his whole village with his innovation; at the end of the story, William says that his entire village has electricity, a well with clean water, and is able to grow a variety of crops where before they only grew maize and tobacco. That is impressive for anyone, but he did it all before he was twenty. Goodness only knows what this guy will accomplish after he finishes school! We hear all the time about how terrible life in Africa is, about the squalor and the disease and the infection. This book didn't ignore that; William describes for quite some time the effects of famine and starvation. But he does not ask for pity. He does not ask for international aid or bemoan corrupt government officials. Rather, the famine made him really think about what he could do to make his life better, how to raise himself above the cycle of poverty. It was really refreshing to read. William doesn't want international aid- he wants Africans to use the resources they have to innovate and create things they can be proud of. The language used can be really technical at times. Well, for me- I am very happy for William that he created a massive windmill, but I didn't need to know about every part used and how they all fit together. I admit to skimming through those parts. But they serve to show just how much passion William has for his project, and just how hard he was willing to work to see it to fruition. It's a very inspiring story. I really enjoy reading about grassroots programs like this, where people just try so hard to make an impact on the world (other books that show people like this are Leaving Microsoft to Change the World and Three Cups of Tea). If anyone has further suggested reading along these lines, let me know! In the meantime, read and enjoy William's story. I really need to read this. I have had it on my shelf since July and I tried reading it during the readathon, but it wasn't a good readathon selection for me. Great review! It sounds like this would be a really great feel good book, and like one I'd very much like to read. It's amazing that William was able to so change the lives of his fellow villagers. This one definitely goes on the list. Thanks! Wonderful review Aart. I have this book in my ARC pile. I hope I can get to it soon. I, too, definitely need to read this! Great review, Aarti. I've read a lot of good things about this book. It definitely sounds like something I would enjoy. Great review. I definitely want to read this one. I can't wait to read this - looks SO good.